Air cooling is a simple means of dissipating heat within industrial and mobile machines. The fluid – usually oil or water-glycol – flows through a cooler. A fan draws air and drives it through the cooling element. Thus, there is a temperature difference and heat exchange takes place. Of this results an increase in air temperature which is then released into the environment. This process reduces the average temperature of the fluid up to a few Celsius degrees over the actual environmental temperature. It is possible to install an air cooler in almost every situation, with a minimum impact on the existing lay out. The operating costs are correspondingly low and their further reduction is possible by using a speed-controlled fan. With new designs using special, low noise fans and optimised air ducting we can also offer coolers with outstanding low noise emissions. A wide range of coolers is available, with either axial and radial fan designs. AC, DC electric drives, and hydraulic motors ensure versatility in catering to a variety of applications and ambient conditions. 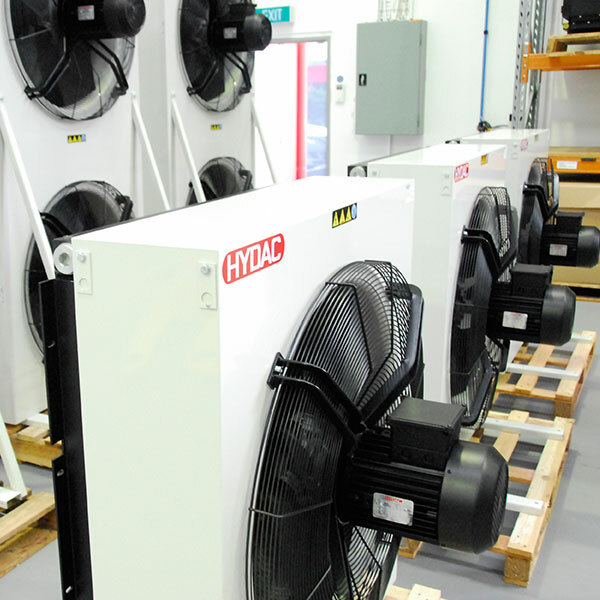 The manufacture of the aluminum cooling elements takes place in our own HYDAC production plants. 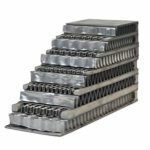 The cooling elements in ‘plate and bar’ construction demonstrate particularly impressive strength, design flexibility, and optimal heat transfer. We offer a large selection of air fin and fluid turbulator designs, ensuring radiators are tuned to provide maximum capacity in every situation – even in extremely contaminated environments. Since product life cycles get shorter, it is necessary to develop multiple reliable versions of a new cooler design as soon as possible. Technical simulation plays an essential role here because it helps reduce development costs and times. Moreover, simulation as part of the development process results in the more accurate design and optimisation. This happens long before the production of the prototypes. Last but not least, real-life tests can be kept to an absolute minimum. With KULI software is possible to assess the heat management of a machine as a whole. But its utilisation can also be to design individual coolers or heat exchangers. By simulating various heat balances of individual components based on the measurement data of a model heat exchanger in the wind tunnel, reliable coolers, and cooling systems are the results. In addition to KULI, computational fluid dynamics (CFD) are an important method to optimise coolers, heat exchangers, and cooling systems. Its purpose is to solve any given fluid dynamic or thermodynamic problem using numerical methods. For example, the CFD utilisation can be to analyse the effects of real, customer-specific installation situations on the cooler performance. Finally, the FEM method, i.e. the numerical analysis of problems in structural mechanics and thermal mechanics, is an important tool in a development-stage simulation. Above all, it also serves to assess structural stress and reduce hot spot stress in order to extend service life. A team of development engineers by HYDAC works with the simulation methods depicted above in order to optimise existing components and systems and to identify new approaches to solutions, including custom solutions.